BIBLE HISTORY DAILY: How the Serpent Became Satan. Adam, Eve and the serpent in the Garden of Eden (Shawna Dolansky). Introduced as “the most clever of all of the beasts of the field that YHWH God had made,” the serpent in the Garden of Eden is portrayed as just that: a serpent. Satan does not make an appearance in Genesis 2–3, for the simple reason that when the story was written, the concept of the devil had not yet been invented. Explaining the serpent in the Garden of Eden as Satan would have been as foreign a concept to the ancient authors of the text as referring to Ezekiel’s vision as a UFO (but Google “Ezekiel’s vision” now, and you’ll see that plenty of people today have made that connection!). In fact, while the word satan appears elsewhere in the Hebrew Bible/Old Testament, it is never a proper name; since there is no devil in ancient Israel’s worldview, there can’t yet have been a proper name for such a creature. A good overview of the development of the figure of Satan. Past posts on Satan/the Devil are collected here plus here. Crystal Addey, Divination and Theurgy in Neoplatonism: Oracles of the Gods. Ashgate studies in philosophy and theology in late antiquity. Farnham; Burlington, VT: Ashgate, 2014. Pp. xv, 335. ISBN 9781409451525. $134.95. In the last decades, the religious and ritual side of Neoplatonism has attracted growing scholarly interest. Crystal Addey’s study is part of this discourse. It explores divination as a central facet of the rituals that were subsumed in Neoplatonic circles under the label “theurgy”. The focus lies on two major figures whose debate shaped the Neoplatonic discourse about rituals: Porphyry and Iamblichus. The book aims to demonstrate the basic harmony between the two philosophers as far as divination and rituals are concerned. In so doing, it inserts itself into a strand of research that emphasises the fundamental unity of the Porphyrian oeuvre, also as far as rituals are concerned (e.g. Smith 2007 and 2011, Busine 2004 or 2005, Johnson 2013). Neoplatonism was an important philosophical — and in some ways religious —movement in the late antique world where Judaism and Christianity also lived. Related post here. ANCIENT JEW REVIEW: Unexpected Influences | Elizabeth A. Clark and Tal Ilan. I dare say the reader will find a surprise or two here. At least I did. TALMUD WATCH: Talmud Boyz learn and bond studying religious texts (Debra Lefkowitz, Massachusetts Sharon Avocate). They first met more than 15 years ago. At the time, all were residents of Sharon and members of its Conservative synagogue, Temple Israel. A family doctor, college professor, engineer, psychologist and medical illustrator. All seeking the intellectual challenge and discipline of studying Jewish texts for a few hours every week, squeezed between their early-hour fathering responsibilities and later-morning professional obligations. Striar Jewish Community Center in Stoughton quickly became the logical location for their meetings. Some of the men exercised at the facility, others passed by en route to school drop-offs or work; and all felt at home at the Jewish facility. Their weekly meetings originally focused on the Talmud, an ancient, dense and complex document, which in its entirety consists of 63 tractates or discussions running more than 6,200 pages long. The group wasn’t sure that they were up for the challenge, but they plunged into what one participant humorously refers to as self-misdirected study. They spent the first few years selecting sections of interest, reading a couple of lines in Hebrew and English, trying to decipher the text’s often cryptic and always multi-layered meanings, and make sense of its teachings in the context of Jewish history, today’s world, and their own lives. More on the Dunhuang caves exhibition in L.A.
THOSE TREASURES FROM THE SILK ROAD: Artifacts from ancient Chinese cave temples head west for California exhibit. Situated on the edge of the Gobi desert, the Dunhuang caves features six miles of art many centuries old – and now an American audience will get a taste of it (Jordan Riefe, The Guardian). There's nothing really new in this article, but it gives a good overview of the historical background of the caves and their contents, which included Buddhist, Christian, and Jewish manuscripts in various languages. My bold emphasis. This reference to a Hebrew Psalm fragment raises some interesting points. I was informed years ago (scroll down) that this fragment (assuming it is the same) is actually a page from the Slichot prayers ("the penitence oriented prayers recited around the High Holidays"), rather than the biblical Book of Psalms. But I have also read elsewhere that the Book of Psalms in a Syriac translation was found in the caves. I don't know if this is real or is a further misunderstanding of the reference to this Judeo-Persian prayer fragment. Does anyone know? An earlier post on the Getty exhibition, with lots of related past posts, is here and links. Cross-file under Syriac Watch. Eberhard W. Sauer, Hamid Omrani Rekavandi, Tony J. Wilkinson, Jebrael Nokandeh, Persia's Imperial Power in Late Antiquity: the Great Wall of Gorgan and the Frontier Landscapes of Sasanian Iran. British Institute of Persian Studies. Archaeological monographs series, 2. Oxford; Oakville, CT: Oxbow Books, 2013. Pp. xvi, 712. ISBN 9781842175194. $150.00. The book under review here is not only a significant contribution to the study of the dating, origins, and function of the Great Wall of Gorgan in northeastern Iran. It also touches on broader themes in Sasanian history, including economic, administrative, and military matters as well as the question of the empire’s cohesiveness. Indirectly relevant to PaleoJudaica, but interesting as background, since the Sassanian Empire had a flourishing Jewish population in late antiquity. Some past posts on ancient Iranian Judaism are here, here, here, here, here, and links. AWOL: Special Issue: Digital Humanities in Ancient Jewish, Christian and Arabic Traditions: Journal of Religion, Media and Digital Culture. ARCHAEOLOGY MAGAZINE: The World's Oldest Writing: Cuneiform Religion. The story of George Smith's discovery of the Mesopotamian Flood narrative in the Epic of Gilgamesh is a great one, only the first part of which is told at the link. For the rest, see the link at this post. In brief, Smith found part of the Flood story on a tablet in the British Museum, he convinced the Daily Telegraph to put up money for him to go to Ottoman Iraq to try to find the rest of the story, and then within three days of digging at the site of Nineveh he found a fragment of the Epic of Atrahasis which filled in the missing material. The full story is so implausible that it would have to be true: fiction dares not rely on coincidence and good luck the way reality can. His story ended in tragedy and premature death, but left him a name and glory. Gilgamesh would have approved. Lots more on the Epic of Gilgamesh and its relevance to ancient Judaism etc. is here and links. OLD TESTAMENT PSEUDEPIGRAPHA WATCH: Author Claims Return of Christ Tied to Nuclear War and Three Days of Darkness (Michael Fortner, Christian News Wire). LAWTON, Okla., May 2, 2016 /Christian Newswire/ -- Journalist, historian, and Bible prophecy author, Michael D. Fortner has released his latest book, "The Approaching Apocalypse and Three Days of Darkness." In his new book, he claims that a multi-nation nuclear war will take place at the end of WW3, followed shortly by an asteroid impact, both of which will cover the world with dark clouds and threaten to bring nuclear/cosmic winter. He says the world will be in complete darkness for three days, during which Christ will return and burn up the black clouds with fire from heaven. In this way, Christ will save the world from self-destruction, even though the fire will also kill many people. The nuclear war and asteroid impact will also create poison air that will kill more people than WW3. He arrived at his thesis by analyzing many prophecies inside and outside the Bible, including the Book of Enoch, Sibylline Oracles, Apocrypha, Pseudepigrapha, and even Catholic and Protestant prophecies. He pieces them together like a jigsaw puzzle. One of the important things he discovered is how God will send fire from heaven, from a small second sun that will appear in the sky some weeks or months beforehand. Fortner presents many prophecies that speak of this second sun, going all the way back to the Erythraean Sibyl. As usual, my interest here is sociological rather than theological or survivalist. Not so long ago an author in the mode of Hal Lindsey writing about the apocalypse wouldn't have gone near the noncanonical scriptural literature. They were not the Bible and so were entirely without authority and probably heretical. Times change. There is lots of material for apocalypticists in 1 Enoch and the Sibylline Oracles, both found in the Old Testament Pseudepigrapha, and it seems that such writers are now turning to this rich vein of material. I suppose that's progress of a sort. In any case, I am always glad to see the Pseudepigrapha getting some attention. Incidentally, the Erythraen Sibyl was one of ten or twelve legendary Sibyls. The surviving Greek Sibylline Oracles are attributed, in the few cases when one is specified, to the Chaldean Sibyl, daughter or daughter-in-law of Noah (see Collins's translation in the first of Charlesworth's Old Testament Pseudepigrapha volumes) or the Tiburtine Sibyl (see the translation by Rieuwerd Buitenwerf in Bauckham, Davila, Panayotov, Old Testament Pseudepigrapha: More Noncanonical Scriptures, vol 1). There is also a Latin book of the "Witch Sibyl" (Sibylla Maga), which is forthcoming in an English translation by Johannes Magliano-Tromp in volume 2 of Old Testament Pseudepigrapha: More Noncanonical Scriptures, which is now in preparation. ORCHESTRA: Reviews Maja Ratkje CREPUSCULAR HOUR (Euan Andrews, The Quietus). Norwegian composer Ratkje's mesmerising Crepuscular Hour seeps through the liminal cracks between light and dark, the spiritual gloaming during which living bodies and minds change their patterns of behaviour. Recorded during the 2012 Huddersfield Contemporary Music Festival, it is a piece for three choirs, three noise musicians and church organ. It begins with an almighty sharp intake of breath, like the oxygen were being sucked out of a vast space as if by one violently conjoined sigh, and it is these gathered voices which predominate throughout the performance. Based around texts from the Nag Hammed Library, a collection of early Gnostic gospels discovered in Egypt in 1945, the choirs augur portents of chaos and battle while sounding scarcely human, or at least not the work of individual human beings. Here, as with the most extreme choral work of Ligeti, we have the voices of living people turned to mass invocation of barely suppressed terror and hysteria in the face of cataclysm. My bold emphasis. Yes, the entire review sounds this earnest. IN HONOR OF ISRAEL INDEPENDENCE DAY: What Are the Weird Scribbles on the State of Israel's Emblem? They look startlingly like dragons and nymphs found at the temple of Apollo in Didyma, with allowances made for Jewish custom (Elon Gilad, Haaretz). Out of the hundreds of suggestions that arrived, the committee chose a design submitted by the brothers Gabriel and Maxim Shamir: a schematic menorah with seven six-pointed stars over it and an olive branch on each side. But the committee asked the brothers Shamir to make the menorah look more ancient, and to add Israel's name. 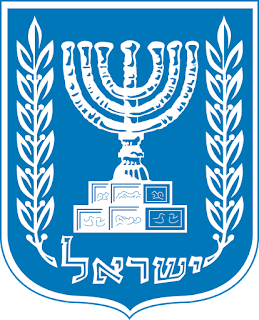 The result was the Emblem of the State of Israel, which the government approved on February 10, 1949. 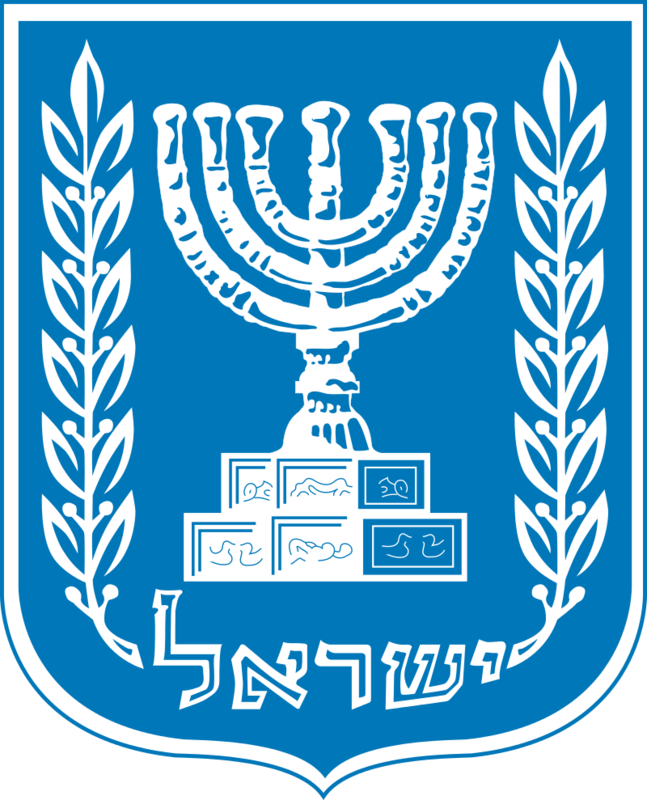 The menorah that the Shamir brothers ultimately used on the symbol was a stylized version of the menorah carved in relief on Titus’ Arch in Rome. The arch was built in 83 CE to mark the victories of the deceased emperor – including the conquest of Jerusalem (Titus himself died in 81 CE). Simply, those scribbles on the emblem are simplified versions of the ornamentation on the base of the menorah that is depicted on the arch. You can see a photo of the relevant relief on the Arch of Titus here (scroll down, last photo). And for more on the Arch of Titus, start here and follow the links. Today is Israel's 68th Independence Day. Yona Sabar's column this week is relevant: Hebrew word of the week: Yom ’Atsma’ut. King Herod may have changed the menorah, or perhaps just its base, after it was damaged or stolen when the Parthians sacked Jerusalem in 40 BCE. Or perhaps, he made the adjustment as part of his reconstruction of the Temple during his reign. We just don’t know. So it seems that there are good arguments for the menorah on Titus’ Arch and on the Emblem of the State of Israel both being and not being in the Temple. The debate could really only be settled for sure if the menorah itself were to be discovered, but that is unlikely to ever happen. In 410 CE, the Vandals sacked Rome and carried away its treasures. The menorah, which had been sitting in a pagan temple since its arrival in Rome hundreds of years earlier, was probably taken by them, never to be seen again. AWOL: The Standard Babylonian Epic of Gilgamesh. The Epic of Gilgamesh is surprisingly relevant for the study of the Bible, ancient Judaism, and even late antique Christianity. Gilgamesh resurfaces as a giant in the Book of Giants and the Epic has connections with the Flood Story etc. And Gilgamesh remains influential in popular culture even today. On all this, see the past posts here, here, here, here, here, and here. That Rabelaisian laugh cuts against the grain of the film's welcome seriousness. Last Days [in the Desert] is weighty and somber, familiar and strange, in the way of Bible stories but not of contemporary faith-based filmmaking, which eschews mystery and paradox for homily. The story, a consistent surprise, becomes domestic apocrypha, after opening with Jesus — known here as “Holy Man,” “rabbi” and “Yeshua” — wandering sun-blasted vistas en route to Jerusalem. If this review is any indication, Last Days in the Desert doesn't have much to do with past traditions about Jesus, inside or outside the canon. Cross-file under (Modern) New Testament Apocrypha Watch. I CAN'T ARGUE WITH THIS: French PM: UNESCO resolution on Jerusalem ‘unfortunate, clumsy’ (AP/JTA). Background here and links. PUNIC WATCH: Tunisia: Cultural Event - Hannibal in Carthage (allAfrica.com). Tunis — The Carthage palace hosted, on Monday, a cultural event on "Hannibal in Carthage", devoted to the military leader and Carthaginian politician Hannibal Barca. The event was marked by an exhibition of archaeological finds, inaugurated by Foreign Minister Khemaies Jhinaoui and his Italian counterpart Paolo Gentilioni. Mainly displayed, a statue of the famous Carthaginian leader found in the 16th century in the city of Capo in Italy and lent by the Italian presidential palace (Quirinal palace). Among the other pieces exhibited, a bronze shield found in one the Punic graves of Ksour Essef (governorate of Mahdia). Hannibal and his army have been receiving some media attention recently (cf. also here). And here is a reminder of why Phoenician and Punic matter to PaleoJudaica. 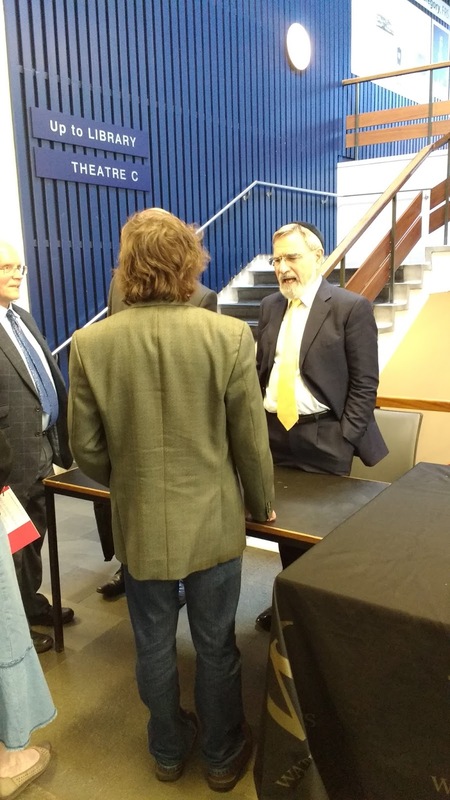 RABBI LORD JONATHAN SACKS GAVE THE Templeton Prize Lecture: Not in God’s Name: Confronting Religious Violence earlier this week in St. Andrews. A global religious leader, philosopher, award-winning author and moral voice for our time, Rabbi Lord Jonathan Sacks was recently named the winner of the 2016 Templeton Prize. Rabbi Sacks is currently the Ingeborg and Ira Rennert Global Distinguished Professor of Judaic Thought at New York University and the Kressel and Ephrat Family University Professor of Jewish Thought at Yeshiva University. He is also Professor of Law, Ethics and the Bible at King’s College London. Previously, Rabbi Sacks served as Chief Rabbi of the United Hebrew Congregations of the Commonwealth between September 1991 and September 2013, only the sixth incumbent since the role was formalised in 1845. 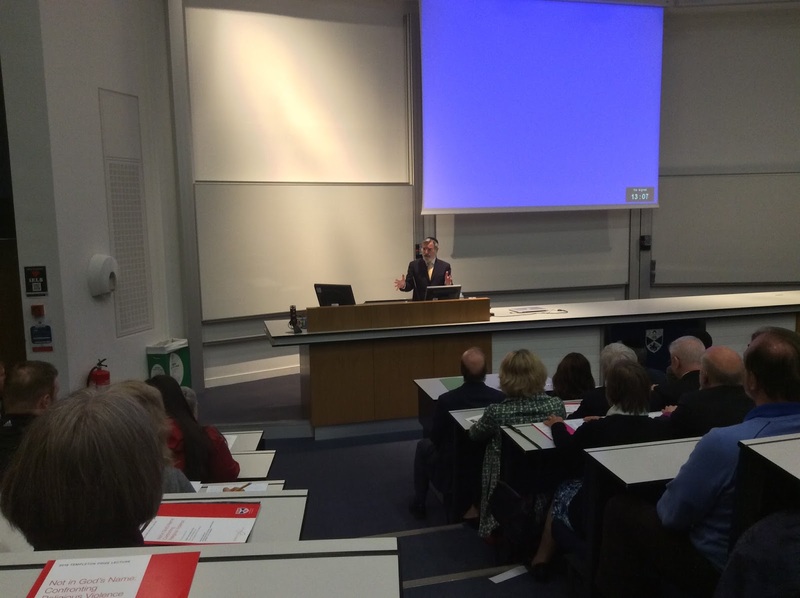 The Title of Rabbi Lord Sacks' Lecture is 'Not in God's Name: Confronting Religious Violence'. He was chief rabbi for 30 years and is also the longest-serving person on the BBC’s 'Thought for the Day' programme. He has worked tirelessly to foster good relations and understanding between different faiths. He is this year's Templeton Prize Laureate and is due to be awarded the annual £1.1 million Templeton Prize in London on May 26. Congratulations to Rabbi Sacks on the Templeton Prize. It was great to have him here. WILLIAM ROSS: LXX SCHOLAR INTERVIEW: DR. EMANUEL TOV. A couple of Ross's previous LXX scholar interviews were noted here and here. This one is in video format. A new study from Tel Aviv University, Cornell University and the Albert Einstein College of Medicine reveals genetic proof of the Jewish roots of the Bene Israel community in the western part of India. They have always considered themselves Jewish. "Almost nothing is known about the Bene Israel community before the 18th century, when Cochin Jews and later Christian missionaries first came into contact with it," says first author Yedael Waldman of both TAU's Department of Molecular Microbiology and Cornell's Department of Biological Statistics and Computational Biology. "Beyond vague oral history and speculations, there has been no independent support for Bene Israel claims of Jewish ancestry, claims that have remained shrouded in legend." "We found that while Bene Israel individuals genetically resemble local Indian populations, they constitute a clearly separated and unique population in India," Waldman says. "The results point to Bene Israel being an 'admixed' population, with both Jewish and Indian ancestry. The genetic contribution of each of these ancestral populations is substantial," adds study co-lead author Arjun Biddanda of Cornell. The results even indicate when the Jewish and Indian ancestors of Bene Israel "admixed": some 19-33 generations (approximately 650-1,050 years) ago. "We believe that the first encounter involved Middle-Eastern Jews and was followed by a high rate of tribal intermarriage," says Waldman. "This study provides a new example of how genetic analysis can be a valuable and powerful tool to advance our knowledge of human history." The study sounds very interesting, although it is based on only 18 individuals, which doesn't sound like many to me. Elements of the statement could be phrased more clearly. It says that the study "reveals genetic proof of the Jewish roots of the Bene Israel community," but also "while Bene Israel individuals genetically resemble local Indian populations, they constitute a clearly separated and unique population in India." The rest seems to imply that the separate and unique element can be identified specifically as Jewish, but it doesn't quite spell it out. Maybe I am parsing too finely, but some clarification would be helpful. There are some past posts (here and links) on genetic testing of another group in India called the Bene Menashe, who have the tradition that they descend from the lost ten tribes of Israel. Whatever the historical merits of the claim, their genetic profile does seem to have Middle Eastern connections. Past posts on genetic studies and their implications for the history of Judaism are collected here and here. PENN STATE NEWS: Falk to co-edit new critical editions of Dead Sea Scrolls (Cherie Winner). UNIVERSITY PARK, Pa. -- Penn State scholar Daniel Falk has been named one of three editors on an international project to produce new critical editions of the Dead Sea Scrolls, the ancient documents that contain some of the earliest known versions of Biblical texts. The 15-volume series, known as Dead Sea Scrolls Editions, will feature improved reconstructions of previously published texts and some texts that have not been published before. It will be published by the Dutch firm Brill Publishers. Falk, who is Chaiken Family Chair in Jewish Studies at Penn State, is a recognized expert on the Dead Sea Scrolls, specializing in the analysis of papyrus fragments and prayer texts. His co-editors on the project will be Martin Abegg Jr., recently retired from Trinity Western University in Langley, British Columbia, and Alison Schofield of the University of Denver. As critical editions, the books will include all known versions of each text, along with different interpretations of them that have been made over the years. 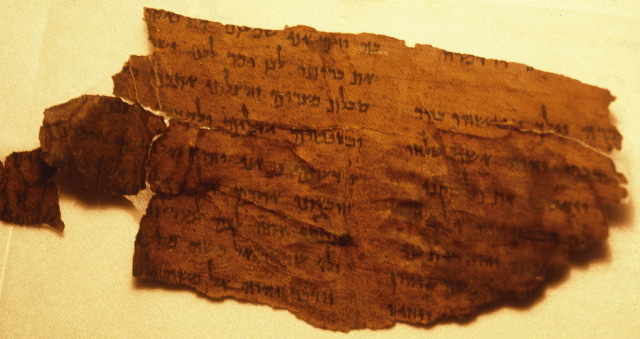 With documents like the Dead Sea Scrolls, where the originals are often fragmentary and hard to read, such comparisons are essential to resolving questions about the meaning and even, in some cases, the specific wording of the text. The first volume will an edition of the Temple Scroll. TRAVEL ADVISORY: Israel warns Jewish pilgrims of ‘severe’ terror threat in Tunisia. As Lag B’Omer festival approaches, counter-terror agency sees ‘concrete’ jihadist threat on historic Djerba island (Times of Israel). Israel’s Counter-Terrorism Bureau on Monday highlighted a “severe” travel advisory for Tunisia. Many Jews who hail from the Mediterranean Arab country travel each year to the island of Djerba in the country’s south, the historic home of an ancient community of Jewish priestly families, to celebrate the Lag B’Omer holiday, which this year falls on May 25-26. The bureau, a branch of the Prime Minister’s Office, on Monday urged Israelis and Jews not to visit the country this year due to the “high” likelihood of attacks by jihadist groups. That's a pity. More on the Tunisian island of Djerba and its ancient synagogue is here and links. And there's more on Tunisian archaeology and the terrorist threat to its tourist industry here and links. When is a betrothal not a betrothal in the Talmud? THIS WEEK'S DAF YOMI COLUMN BY ADAM KIRSCH IN TABLET: The True Pleasure of the Talmud Is Its Intellectual Gamesmanship. In this week’s ‘Daf Yomi’ reading, a pair of sages engage in a duel of the mind, posing, parrying, and riposting over hypothetical marriage and sexual scenarios. For a man to betroth a woman, we have learned in Tractate Kiddushin, requires two things: a declaration of intent, and the transfer of money or an item of value worth at least one peruta. This seems straightforward enough, but as always in the Talmud, the rabbis are alert to possible complications. There are many ways that betrothal can go wrong, due to a flaw in either the declaration or the purchase. This week’s Daf Yomi reading explored a number of these possible errors and in doing so entered into fairly remote regions of the law. Because halakha is one vast system, you can easily start out talking about betrothal and end up talking about tithing or agricultural laws. ALIN SUCIU: Forthcoming: Shenoute and the Bible, International Conference, Georg-August-Universität, Göttingen, 17–21 May 2016. Cross-file under Coptic Watch. More on Shenoute, his White Monastery, and its manuscripts is here and links. EXCAVATION: Archaeologists Find the Last Hideout of the Jewish Revolt in Jerusalem. Titus' soldiers ripped paving stones out of the street to find the last rebels 2,000 years ago. Archaeologists think they have found those hiding places (Ariel David, Haaretz). Below the street’s thick slab stones lay a large roofed drainage canal that channeled rain water away from the city. It was in this underground channel, which was wide and tall enough for people to comfortably stand in, that archeologists found the first puzzle. Among the sediments and refuse that had filled it up were several coins from the period of the revolt that confirmed the dating of the site - as well as cooking pots and utensils. The second clue came from the state of the street above. Most of it was intact, except that in five spots the paving stones had been broken and removed to create an opening into the canal below, Reich says. Researchers now connect these finds to the text of Josephus Flavius, the Jewish-rebel-turned-Roman-collaborator who wrote the history of the revolt. In “The Jewish War,” Josephus recounts how, after the Roman legions, led by Titus, breached the walls of Jerusalem and burned down the Temple, some of the surviving rebels and civilians took refuge in the sewers and underground spaces of the city. CONSERVATION: Second Temple era archaeological site suffer serious damage. Visitors to Solomon's Pools report a part of one of the water reservoir's walls had collapsed; they urged the PA to either make the necessary repairs the site, which is located in Area A, or allow Israel to (Itay Blumenthal, Ynetnews). Solomon’s Pools, a historic site built in the Gush Etzion region over 2,000 years ago during the time of the Second Temple, has been damaged, perhaps irreparably. Visitors who documented the damage to the site, located in Area A, demanded that the Palestinian Authority work to fix it or otherwise allow Israel to restore it. “This is the most impressive water area that was built in the common era,” explained tour guide Benjamin Tropper. It is still unclear whether the archaeological site was damaged as a result of harsh weather conditions or due to neglect. Other recent references to the Gush Etzion region are collected here. Solomon's Pools have been mentioned ealier here. SARCASM: After Temple Mount resolution, PM offers UN staff a Jewish history lesson. Netanyahu announces session following passage of UNESCO text that omits mention of Jewish ties to holiest site in Judaism (Times of Israel/AP). The response: UN official rejects Netanyahu invitation for seminar on Jerusalem. Too bad. It sounded like a good seminar. Brian B. Schmidt presents five case studies in which architectural spaces, artifacts, epigraphs, images and biblical manuscripts corroborate the existence of a robust daimonic realm ruled by YHWH and Asherah in late pre-exilic Israel and an embryonic pandemonium foreshadowing later demonological constructs. The material and epigraphic data from Kuntillet Ajrud, Ketef Hinnom, and Khirbet el-Qom, along with the early manuscript evidence from Deut 32 and 1 Sam 28, indicate that this pandemonium wreaked havoc on the living and the dead. These same data also preserve a countervailing realm of apotropaism—a realm over which YHWH and Asherah, portrayed as Egypt’s quintessential protective deities Bes and Beset, governed. Various other material media including amulets, inscribed blessings and decorated jars also conveyed this counteractive apotropaism. Yet, the data as a whole highlight Asherah’s central role in this magical realm as YHWH’s mediatrix. Alongside various protective spirits, Asherah executed divine protection for mortals, those alive and departed, from threatening demons. MATERIAL CULTURE: Solving the Mystery of Ancient Ink Origins (Eve M. Kahn, Antiques column, NYT). Fun facts about current scholarly research on ancient inks. ll this new scholarship could be useful for experts authenticating manuscripts and for conservators trying to stabilize documents damaged by corrosive inks. Extracts in the formulas may also indicate where tree species once flourished and help identify the trade routes for ink products. Some past stories in which ancient ink matters are noted here and here, both with many links. CONFERENCE: ￼THE DEAD SEA SCROLLS AND THE SAMARITAN PENTATEUCH. UNIVERSITY OF STRASBOURG, MAY 26–27, 2016. The discovery of the Dead Sea Scrolls, in the middle of the twentieth century, has brought to light ancient biblical and related manuscripts that exhibit variant readings previously unknown — except for the Samaritan Pentateuch. These affinities raise the issue of the Samaritan Pentateuch’s origins and relationships with other textual traditions of the Hebrew Bible. The Strasbourg conference will explore various aspects in which the Dead Sea Scrolls and the Samaritan Pentateuch shed light on each other: history of religions, linguistics, material philology, textual criticism, exegesis, etc. Please join us on May 26–27 for this international research conference. Organized by Michael Langlois. Follow the link for the conference schedule. Registration information is here. SYRIAC WATCH: Bengaluru Youth Learn Dying Language, Preserve It (Mebin John, The New Indian Express). BENGALURU: Youngsters in the city are trying to preserve a language that survives only among a small community near Kurdisthan, Iraq — Syriac. Many belonging to the ancient Syro-Malabar Catholic Church of India study East Syriac under Rev Thomas Kalayil, a well-known scholar at Bengaluru’s Dharmaram College. City Express speaks to some about their interest in keeping the language alive. Technically, Jesus spoke Galilean Aramaic, a Western Dialect. Syriac is an Eastern dialect of the same language. It was the dialect spoken in the Anatolian city of Edessa, but it expanded to become the language of the Eastern Church and it remains the liturgical language of the Syrian Orthodox Church as well as surviving in Indian Christianity. (East Syriac and West Syriac, mentioned later in the article, are later sub-dialects of Syriac). AINA has also reprinted the article and its link may prove more durable. There are past posts on Syriac in Kerala here and here and links. TALMUD WATCH: Gérard Depardieu, Talmud Scholar? (Talya Zax, The Forward). Gérard Depardieu, the French film star known for his roles in “The Last Metro,” “Cyrano de Bergerac,” and Kenneth Branagh’s “Hamlet” has shed some surprising light on his literary preferences: he’s currently working his way through the Babylonian Talmud. EXHIBITION: L.A.’s Getty Center re-creates ancient China Cave Temples. This sounds like a stretch for ancient Judaism, but the late-antique-to-early-medieval hoard of manuscripts found in the caves at the Silk Road site of Dunhuang did include Jewish and Christian materials, including (not mentioned in this article) Syriac texts. Past posts on the Dunhuang cave manuscripts and related matters are collected here. The Silk Road site of Turfan (Turpan) is also in Northwestern China and it has come up as the place where medieval Manichaean (Manichean) manuscripts, including a version of the Book of Giants, were excavated at around the same time as the caves of Dunhuang. Past posts mentioning Turfan and its manuscripts are here, here, here, here, here, here, and here. PALMYRA WATCH: Russian orchestra plays in Palmyra ruins. The performance in the same ancient amphitheater where ISIS militants carried out widely publicized killings was called 'A Prayer for Palmyra'; Putin also addressed the audience by video, saying he regards the concert "as a sign of gratitude, remembrance and hope." (AP). Good. But meanwhile the violence in Syria continues. Background on this performance is here. And follow the links back from there for much more on the long sad story of Palmyra, its history, the ancient Aramaic dialect spoken there (Palmyrene), and the city's tragic recent fate in the hands of ISIS, followed by its retaking by the Syrian army with the help of the Russians. Let's hope there continue to be happier stories to report from now on. TALMUD WATCH: See the Religious Text the U.S. Government Printed for Concentration-Camp Survivors. It's considered to be the only edition of the Talmud ever printed by a national government (Lily Rothman, Time Magazine). The Survivors’ Talmud stemmed from reasons both practical and symbolic. Not only had the Nazis taken the homes, lives and livelihoods of the Jewish people of Europe, but they had also destroyed the artifacts of the religion. Just when many survivors felt they needed their faith or their culture more than ever, the sacred texts of Judaism were hard to come by. In 1946 a group of DPs ["displaced persons"] who were rabbis asked if the Army could help publish a Talmud, as they had no copies available for study. When the Army agreed, an edition had to be sent from New York to be copied, as no complete version of the Talmud could be found in all of Germany. Just ran across this one, with reference to Holocaust Remembrance Day (Yom HaShoah), which was last Thursday, 5 May. ASOR BLOG: Does the Bible Claim that the Sun and Moon stopped in their Tracks? (Mark Chavalas). Requires free registration to access the full essay. The essay appeared in the LaCrosse Tribune last year, minus the concluding suggestions for further reading, and I noted it here with my own comments. It was important to Saadia that his work became known to Muslims. It would have little polemical value if it simply remained a text used by the Jews. He had been educated in a Muslim environment and spent his life surrounded by Islamic culture; he knew how to make his translation acceptable to the aesthetic refinements of literary Arabic. His purpose may have been to rebut Muslim criticism of the Bible but he deferred to Islamic grammarians and philologists when it came to matters of style. There's more on Saadia Gaon here and more on Arabic translations of the Bible here, here, and here.